The topic for this month on the Great Travelling Round Table Guest Blog, hosted this time by Chris Howard with Andrea Hosth, Carole McDonnell and yours truly, over on Saltwaterwitch. Enjoy! 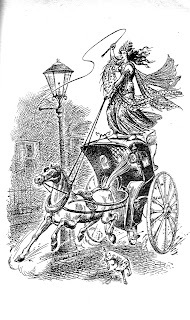 I immediately thought of Jadis the Witch loose in London in C. S. Lewis’ The Magician’s Nephew. 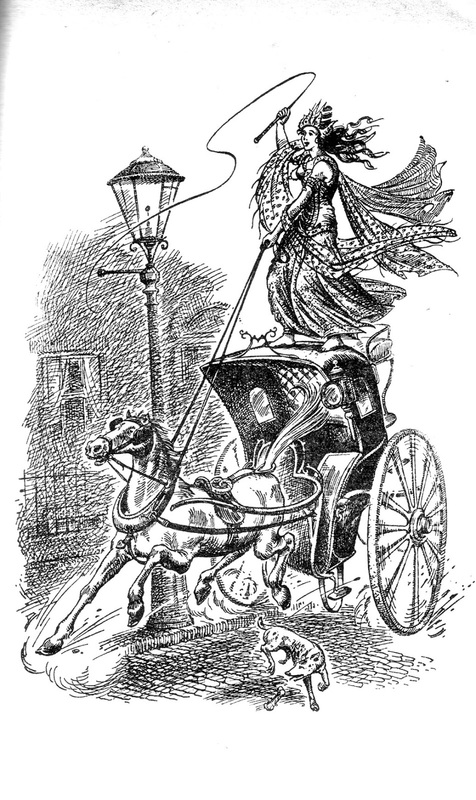 (The illustration is by Pauline Baynes, from my old Puffin edition) In my terms, this is fantasy where Elsewhere comes Here. But then, if that’s intrusive, why call going to Elsewhere a portal-quest? Surely that’s when Here goes Elsewhere? So by analogy, that wd. be Extrusive Fantasy? And the obvious example here is The Lion, the Witch and the Wardrobe, where the children first go to Narnia. But enough frivolity. Both sorts of fantasy have been around a long time, though the current turn of the market has intrusive fantasy wayhay up the visibility scale, with werewolves, vampires, paranormal romance, etc. etc. etc. But as The Magician’s Nephew indicates, such fantasy was well-known in C. S. Lewis’ day. You might even say that “intrusive fantasy” covers the entire range of horror and the ghost story as well, because what are they but stories of intrusion into this world by the unreal? And in these cases, the horror frisson or the fantasy sensawunda, the air of Faery, to misquote Tolkien, comes from the sudden anomaly of the impossible being Right Here in Your Front Yard. Or Front Door, in the Magician’s Nephew’s case. When I read the Lewis I didn’t really get the full flavor of this jolt, since Lewis’s London was already Elsewhere for me. Hansom cabs? This is Here? 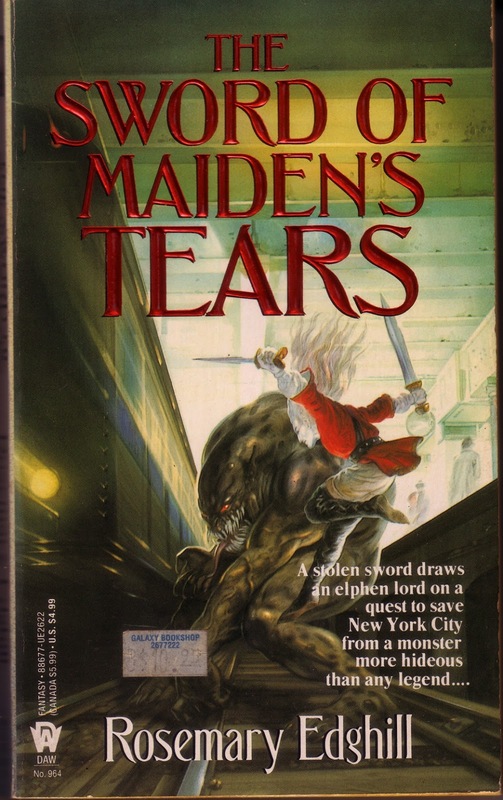 Contemporary intrusive fantasy probably got its first actual market impetus from the Elves in the Supermarket sub-genre pioneered by Mercedes Lackey. For some reason, Lackey has never clicked with me, but the earliest example I thought of for intrusive fantasy came from this sub-genre. It was the first in eluki bes shahar, aka Rosemary Edghill’s unfinished Twelve Treasures series, The Sword of Maiden’s Tears. Later, a teenager in a restaurant does ask for his autograph: “’I saw you in concert last year. Got all your albums.’” Which returns us to the anomalous comedy or errors. But at that one line, “silvery and shining and insulated from mortal touch,” the first time I read the text, I felt the frisson that, like the presence of dragons for Tolkien, signaled the true presence of Elsewhere. It’s rare for me to find that in the now hackneyed presence of werewolves, vampires, etc. etc, and elves are no longer a fashionable form of intrusion. It’s a form I’ve never written myself as fantasy, though a couple of my short stories have featured intrusions into Here. But these intrusion forms are plainly SF. For “The Cretaceous Border,” which is set in my backyard, to accustomed SF wip readers the title instantly signaled the content, and they took for granted that it was SF. Intrusion then, imho, is not merely a feature of fantasy, but occurs across the unrealist genres, including all of horror, and some SF. It’s a useful term, though. Even though I’d love to keep its opposite as well. Extrusive Fantasy. 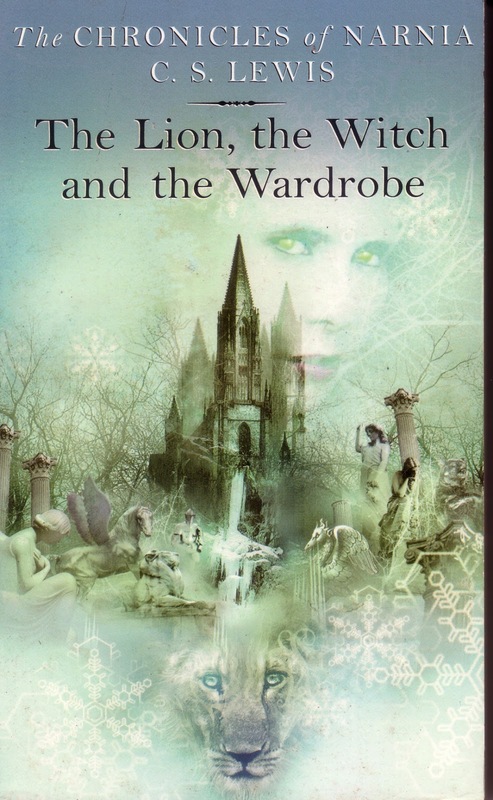 Covers Stephen Donaldson’s Covenant books as well as countless other Go-to-Elsewhere stories, works just as well on the later Twelve Treasure books, where Ruth goes to Elfland, can be applied to some of Diana Wynne Jones’s books like Deep Secret. And given the sausage-machine production line of a lot of current fantasy, it has a handy second inflection. Maybe I’ll try to introduce it into Academia, she said, keeping a very straight face.